This article describes hard bounces, soft bounces, unsubscribes and complaints and how they affect the contact's "Bulk Email Status" field. 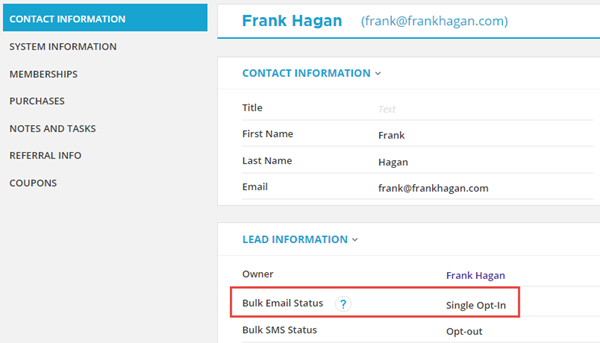 The Bulk Email Status field is found in the Contact Record, and it determines if you can send email to the Contact via a Broadcast, Campaign or any other automation. This is a field maintained by the system, and the only modification you can make to it is to change the status to "Transactional Only" to manually opt a contact out from receiving bulk email. If you change the field the only way to revert to Opt-In or Double Opt-In is for the contact to fill out a form. Single Opt-In: can receive all types of email. Double Opt-In: can receive all types of email. Pending Review: can not receive any email. This is typically found when the contact has just been imported and has not passed our review. Contact Support if it has been more than two business days since the import. Hard Bounce: can not receive any automated email. This status is explained below. Unconfirmed: can not receive any automated email. This status is used when you have specified that double opt-in is required and the contact has not confirmed the opt-in. Transactional Only: receives only non-marketing email such as invoices. This status is usually due to the contact opting out of email using the "Manage Your Subscription" link. Note: In most cases you can still send one-off emails to the individual Contact. It is not considered bulk email if there is only one recipient and it is sent manually. There are two kinds of "bounces". 3rd party spam-blocker on their local computer. Unsubscribes happen when a person clicks the Manage Your Subscription link that appears by law at the bottom of all your bulk emails. Of course, if a person complains they will also be unsubscribed from your sequences and their Bulk Email Status will change to Transactional Only, indicating they do not want marketing content. See our Transactional Email article for more details on this bulk email status. They click the This is Spam (or similar) button within their email program. They click the Unsubscribe link at the bottom of an email and then, rather than merely opting out of receiving future mailings, they additionally click the Report Abuse button at the bottom of the unsubscription page. ONTRAPORT requires you to maintain a complaint rate at 0.1% or below. Our team will reach out if you exceed that rate and work with you to correct it. We reserve the right to terminate accounts with high complaint rates. How do we see the unsubscribe page? Can we change it or edit it? Hi Vanessa - the best way to see the unsubscribe page exactly as your contacts would see it is to add two contact records for your self and send both contact records an email ... the unsubscribe link will appear at the bottom of the message. You do need to send the message to at least two contacts to generate the unsubscribe link (sending a single email to a single contact does not add the unsubscribe link). We do not allow editing of the unsubscribe page. Here is what it looks like if you do not have any Sequences marked "Show this sequence on the Subscription Management Page" (located in the Settings of the Sequence). Hi, does an email confirmation of unsubscribing get sent to the person who unsubscribes and are they automatically marked for "do not email" by ontraport? Are soft-bounced emails re-sent later on? How many times? If an email soft bounces we attempt to send it 3 more times once a day. Once the fourth soft bounce occurs we mark the client as hard bounces. How can someone who accidentally unsubscribed subscribe again? Hi Kat - sorry I didn't see this earlier! There are three ways your Contact can opt in again. They can use an opt in form, and that will reset their "Bulk Email Status" to Opt In. Support can also help you if you have a notice from the customer (the spam laws require proof!) Support can toggle the Bulk Email Status back to "Opt In" after approval by our Email Delivery team in those cases. Good info here, thank you! Is there a way to "unbounce" a contact? I know I could with our previous tool. Have a connect who's status is "hard bounce" but the email address is legit. Thanks in advance for your help! Check the contact and from the Actions drawer select "Double Opt-In" to send them the double opt in email. ONTRAPORT will send that email to Contacts with opt out and hard bounce status in their Bulk Email Status field. You can also have an opt-in form for them where they re-enter their information, and direct them to use that form if you like. Once a contact is marked Hard Bounce, will there be any further attempts to mail them? It appears to be no, but just confirming this? How can I opt-out contacts that have had no activity for a period of time (ie. 180 days) so they do not get sent future emails? Never mind, figured out it needs to be done through rules by giving contact a tag. But can we possibly create an 'Unsubscribe' link on the footer of an Ontramail?